I spent much of Christmas Eve ALONE in the Woman’s Hour Green Room, where the only catering is very bad coffee and highly oxygenated mineral water. This is because the discussion on “Christmas traditions as documented on Woman’s Hour” was the last item on the programme and everyone else had already gone into the studio and was having a high old time whilst I sat on a sofa matching my (red, of course – it’s Christmas) dress listening to their frolics ALONE. All for this discussion with Jenni Murray about (1) changing sheets (or not) when guests come to visit (2) what to wear on Christmas Day (A RED DRESS) and (3) how to cope with children and their consumerist demands (er, probably ignore them). 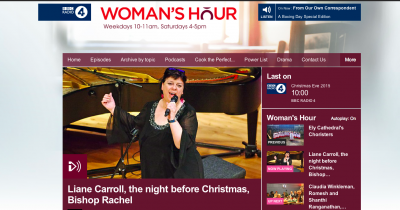 Hats off to Lianne Carroll who performed a beautiful song about being utterly miserable in December. Appropriate.